The linen closet is one of those areas in the home that can remain hidden but can become complete chaos! It’s one of those areas that items can be kept and never used, so it’s time to get this space in your house organised! You may surprised what you find in yours! There is no use trying to organise a space that is filled with clutter and items you no longer use. Go through every item in your linen closet and either; KEEP, DISCARD or DONATE. If you have tonnes of old towels or cloths you can recycle them as cleaning rags, otherwise get rid of them! Now we can get into organising! 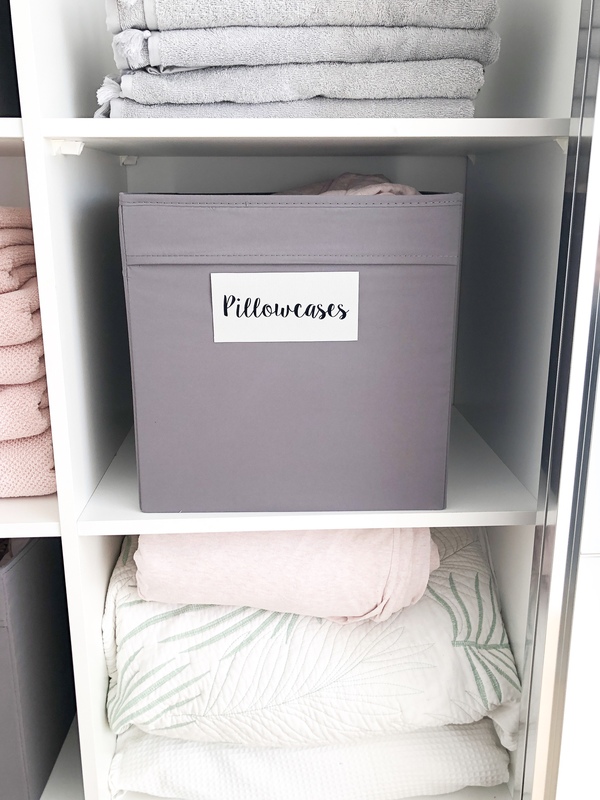 This speaks for itself, fold and match items by likeness; towels, pillowcases, beach towels, flat sheets, fitted sheets etc. This way it is easier to allocate areas of the closet into categories and also maintain a functional but appealing space! 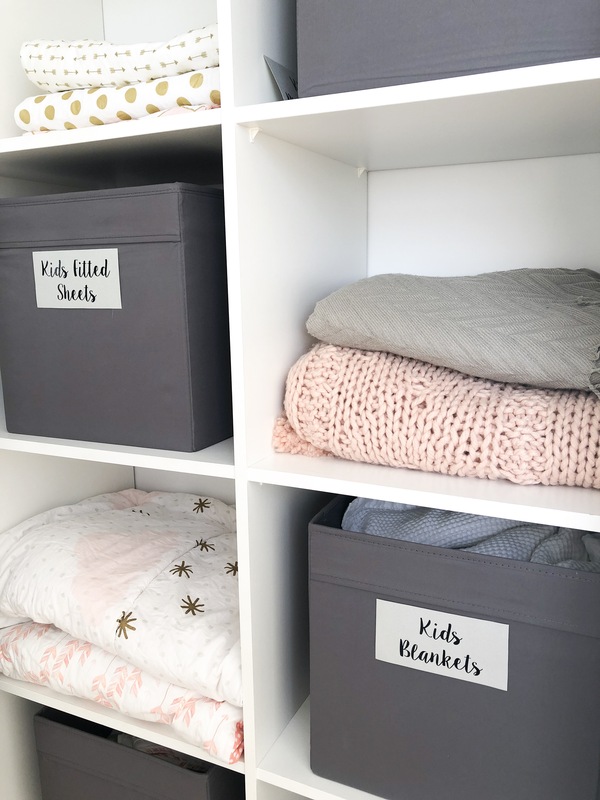 Now this seems obvious but I know plenty of us have towels mixed with bedding, the kids bedding mixed with the king sized sheets, and pillowcases mixed with sheets. SO lets cut our area in quarters; Adults Bedding, Towels, Kids Bedding and Misc (beach towels, throw blankets, weekend bags etc). These four sections will vary for different people and different living situations. But create four distinct areas of the closet so you will know what categories belong in what section. 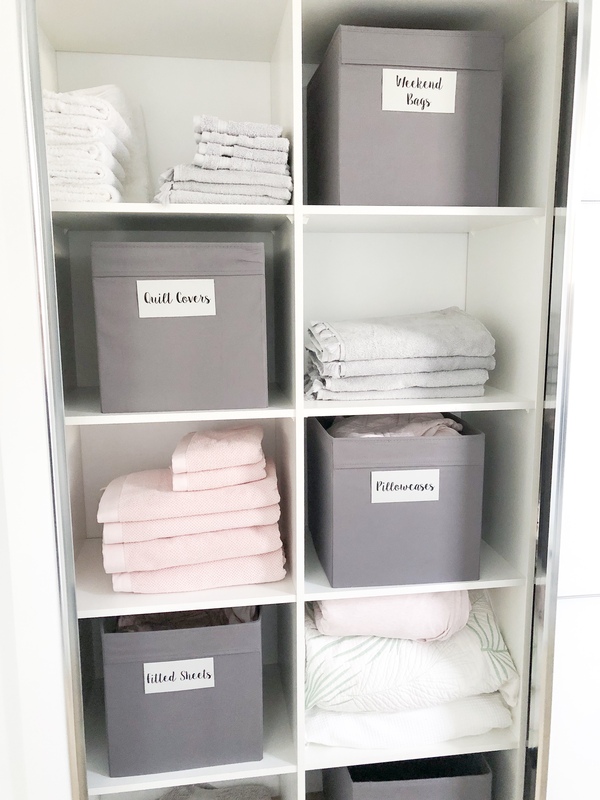 Also be sure to create these categories to be functional; for example with our linen closet the side closest to the bathroom I have allocated for towels because it just makes sense! 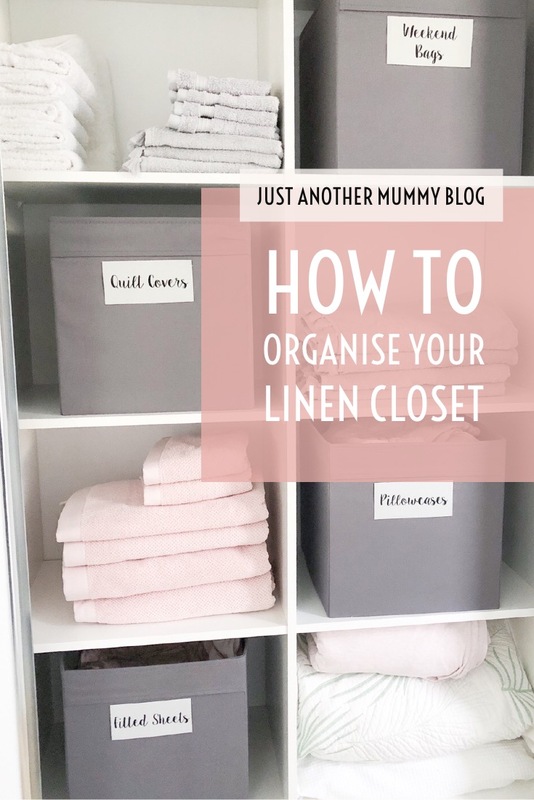 Using tubs or storage cubes is one of the main ways you can really keep your linen closet sectioned and organised. 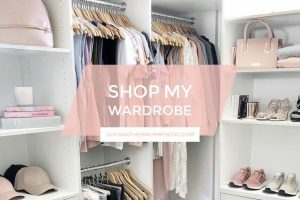 It is a way to structure your closet without having to change the actual shelving. Tubs are also perfect to keep the overall aesthetic of the space. One main point I must stress is to make sure the tubs you use are big enough to fit items such as bedding and towels. You don’t want to waste money on tubs that aren’t going to be big enough. I got my material cubes from IKEA and they come in a range of colours so it can perfectly fit into any home/ interiors theme. I got the dark grey which looks amazing with my light grey and blush colour scheme. Now if you’re anything like me you love to slap a label on it! 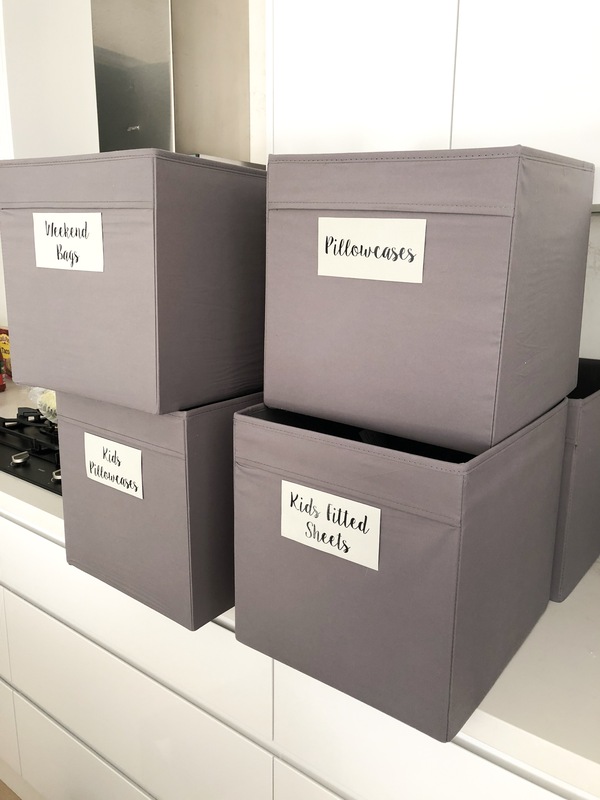 By using labels (especially if your using tubs) this creates a clear structure and then other members in the home will know exactly where things go. It is handy this way so you are not looking through all the tubs to find what you want. 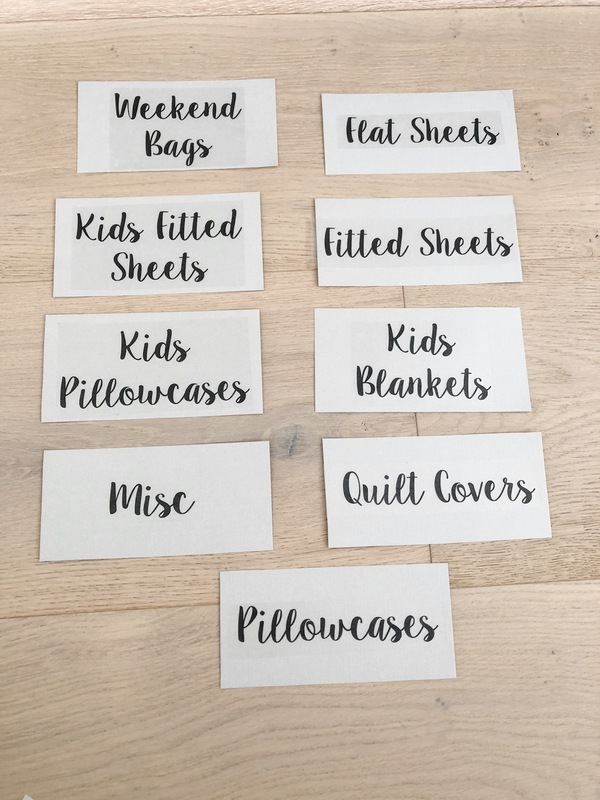 I use the amazing labels from Little Label Co. For the backing of the labels I bought a light grey cardstock from Kmart and glued it on with a hot glue gun! You can also use tags tied on with labels. An alternative; if you are not wanting to use tubs is you can blu-tack labels onto the actual shelf edge. 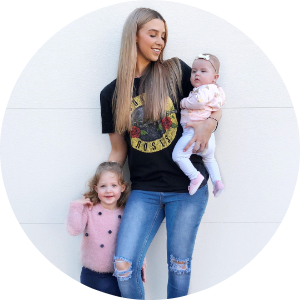 I hope you all enjoyed the first blog of my organisation series!!! 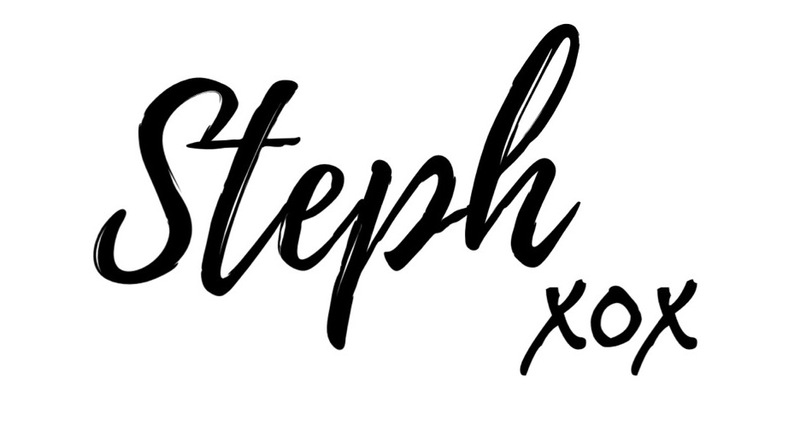 I will also be doing more interiors and home decor blogs too! Beautiful! What are the dimensions of the shelves? I am designing my linen closet and this size looks perfect! I would also love to know what cubes you used and where you bought them from??? Just wow! Beautiful way to organize things neatly. Thank you so much. Great to know how to sort these items in a fashionable way. Thanks a lot.